It’s been over 30 years since my first Caribbean vacation. I spent an unforgettable week in the Virgin Islands at a posh resort on a tranquil bay. Back home in the U.S. I often revisited my memories of that trip, fantasizing about what it would be like to live on the Caribbean Sea. Now I do. My husband and I first visited Belize‘s popular island of Ambergris Caye in 1999 and from that very first trip, we were taken with it. I felt a sense of belonging and community I’d never experienced in the U.S.—including in California where we were living at the time. So in 2008, we made the move…and we haven’t looked back. The cost of living, and of property, is much more affordable than that of most other Caribbean nations. 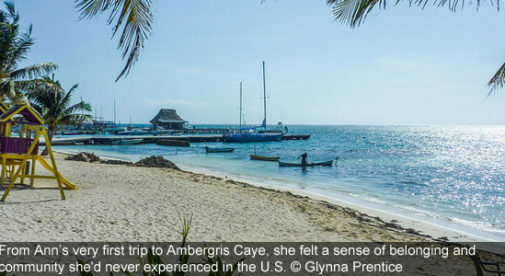 Ambergris Caye is one of the more expensive regions of Belize. It’s a destination that’s incredibly popular with vacationers. But despite its popularity, it’s still very affordable. Many expat couples live well on $2,000 a month. Admittedly, we spend more than that—but we enjoy the little luxuries, like wine and eating out. Still, our cost of living is much less than it would be if we lived in the Virgin Islands or most other Caribbean nations—and less than we were spending when we lived in California. There are even more affordable options for retirees in Belize. In Corozal or Punta Gorda, both towns that are on the sea, a couple can live well on $1,300 to $1,800 a month—including rent. Buy a home and that cost comes down further. On a budget of $100,000 to $200,000, you’ll find a comfortable home with a view in Belize. Gaining residence in Belize is incredibly easy, thanks to the Qualified Retirement Program (QRP). I became a QRP before moving to Belize. Developed to attract expat retirees, this program allows you to import all your household goods to Belize tax-free and ensures that you pay no Belizean taxes on any foreign-earned income. Despite the name, you don’t have to be retired to qualify. Once you are 45 years in age, and can show income of $2,000—including from pensions, Social Security, or investments—you are eligible to apply. QRP retirees need only spend one month per year in Belize but can come and go at will. Being on the mainland, Belize’s geography is larger and more diverse than most Caribbean nations. It’s easy to take a quick side trip to Mexico, or another neighboring country. Many airlines fly into Belize daily, and the local airlines fly between districts on regular schedules. And even from the island of Ambergris Caye where I live, exploring the rest of the country is easy and quick. It’s a breeze to grab a 20-minute flight to the mainland, or take a 90-minute water taxi when it’s time for a change of scenery. The end result of Belize’s easy travel options? It’s possible to kayak along the reef in the morning and be climbing a Maya pyramid in the Cayo District by the afternoon. And if you drive in Belize, you’ll find it much easier than in other Caribbean countries. Unlike many of its Caribbean neighbors, in Belize we drive on the right-hand side of the road—so no need to get used to driving on the left. Anyone who has seen pictures of Belize will know that it’s stunningly beautiful, but you may not realize how rich Belize’s cultural heritage is. This country has a dynamic mix of the Maya, Garinagu (also known as Garifuna), Creole, Mestizo, Mennonite, Chinese, and Lebanese cultures, who all practice have diverse traditions, art, and music.In particular, Maya archaeology and culture is fascinating and unique to this region.